I have recently gained interest in big cats in North America, particularly the mountain lion. 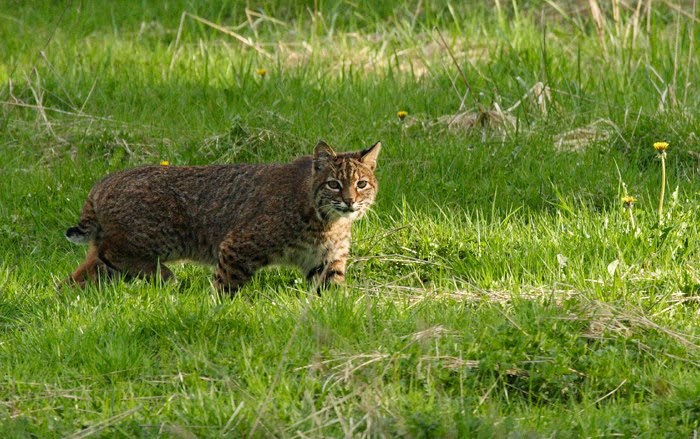 I have never seen one in the wild- largest cat I've seen is the bobcat. Anyone have any field photographs to share? Stories? Also, I read that jaguars make it into parts of the south west. Can anyone confirm this? 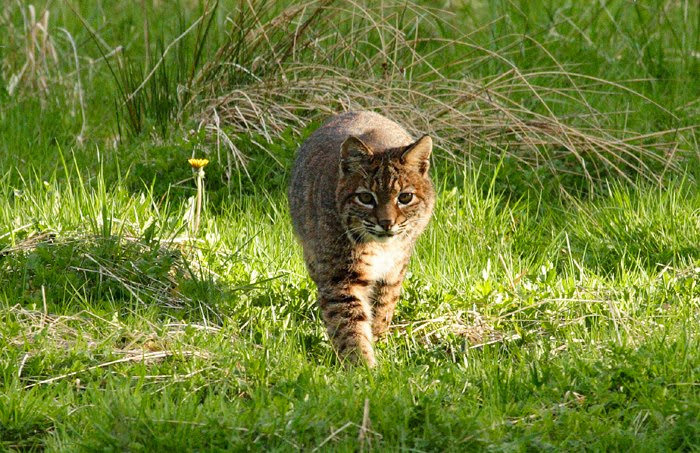 What other wild felines, big or small, reside in the US? Zach_Lim wrote: Also, I read that jaguars make it into parts of the south west. Can anyone confirm this? Hey Zach - Regarding Jaguars, their historic range included W. Texas, New Mexico, Arizona, and California. I recall reading that the last Jaguar in California was killed near Palm Springs in the early 20th Century. They still can be found in Southern Arizona, though sightings are infrequent. If memory serves me correctly, there was a research group that had set up game cams to document Mountain Lions in the area. One of the researchers' game cams captured a Jaguar… this was probably within the last five years. Regarding other wild felines of the SouthWest, we have the Jaguarundi, Ocelot, and a historical sighting of a Margay. The Margay sighting is from Texas in the 19th Century, so we can safely say no to the Margay's presence. Ocelots and Jaguarundis are both medium-sized cats, coming in at about 15-40 lbs. I don't know much about the current status of the Ocelot, but I believe that they can still be found in Texas and Arizona. Jaguarundis are seldom seen, but to the best of my knowledge, are doing well in Arizona. When I herped in Arizona, what I wanted to see most was Jaguar, Jaguarundi, Javelina, and Coatamundi. Didn't see any of the four, but it was exciting to be in their habitat, where I had the off-chance of crossing paths with one of the aforementioned species. The top three are widespread. Jaguar has a few that turn up in the US, but I think they are all thought to be wandering males and no breeding going on. Margay hasn't been seen since 1850-something. Jaguarundi I have no clue and Ocelots have very small numbers in s. Texas, with a huge percent of their US population on Laguna Atascosa National Wildlife Refuge in south Texas. Personally, I have only ever seen 2 Bobcats. One while walking a trail in s. Texas and 1 while roadcruising in Kansas. I would love to see more. 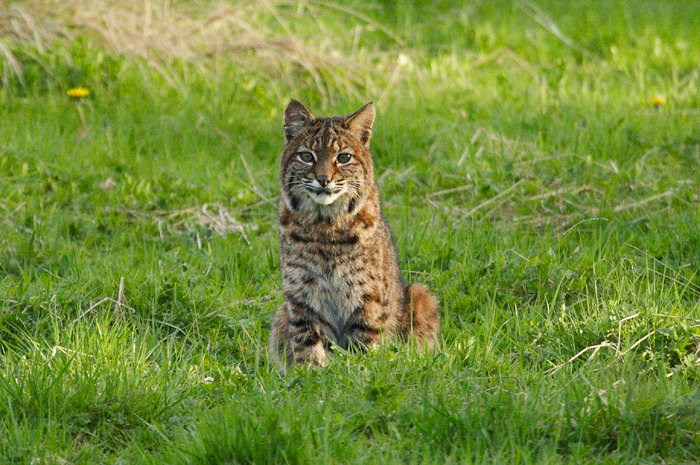 So, if the biggest you have ever seen is a Bobcat, does that mean you have seen other small wild cat species? Thank you for the comprehensive list! I did some quick research and read some great articles about jauguar sightings in Arizona- especially about "Macho A" and "Macho B". I have never heard of a Margay before- what an interesting species! 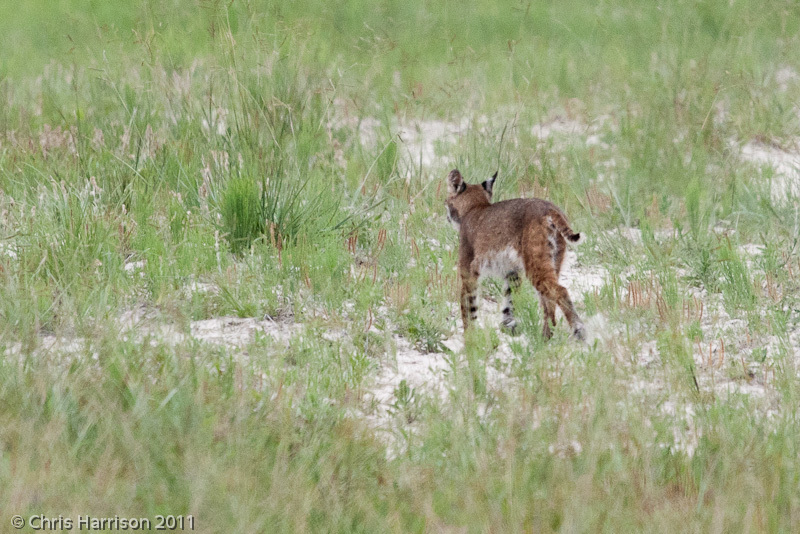 I should rephrase my statement- "I have only seen bobcats before" haha! we get the occasion nuisance bear, as well. The group I know of that is doing work on keeping track of Jaguars in AZ is the SKY ISLAND ALLIANCE. I have a friend who has worked with them for years, and has some excellent photos of various cats seen in AZ on the group's facebook page. I have personally seen several cougars and a handful of bobcats. I cherish every encounter with wild cats. I hope to see a jaguar in the wild, and tracking one in the wild is on my personal bucket list. AS far as I know there have been no confirmed Jagaurundi in the US since the late 80's. South Texas has been heavily surveyed with no luck. As for AZ, I'm not sure when the last documented Jagaurundi was, but it was before the TX one. I have seen one Canada Lynx in AK and several Bobcats in the US. 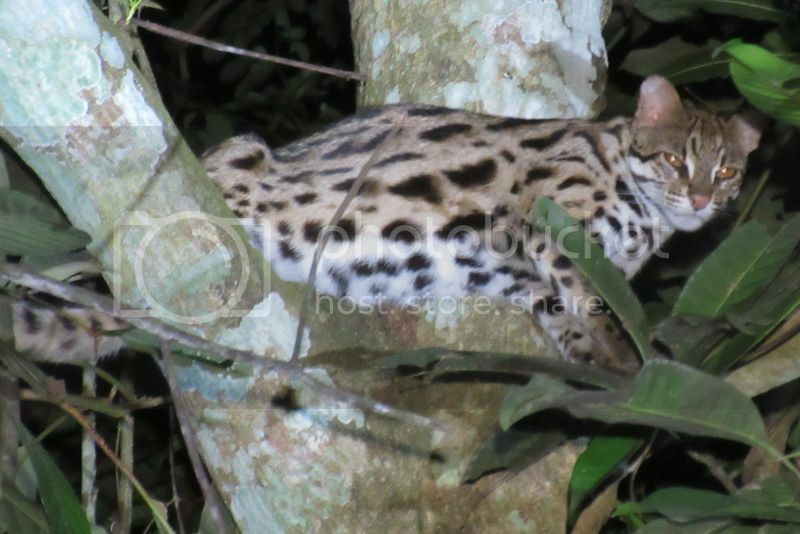 Also, 1 Jaguar and 1 Ocelot in Venezuela. At first I just listed the Cats that occur in North America, here are the rest. African Wildcat - 5 or so. Jungle Cat - 6 or so. All in India. I'm in the same boat as a few other folks on here, here in the US I have only seen 2 bobcats. One while kayaking in Florida and one was trotting along a road in S. Illinois, both encounters were very short but the one in Florida I got a very good look at it. Here in the US, I would absolutely love to see a mountain lion or a lynx or even more bobcats. For the rest I'll go to parts of their range where they are more common. Then I have seen Jaguar and Ocelot tracks in central America, and several (old) Mountain lion kills in the Andes in South America. And participated in a project that camera trapped Clouded leopard, Bay Cat, marbled cat... but I didn't see any of those in person either. I seem to have bad luck with cats. It always seems that I narrowly miss out on seeing them despite being the one that spends the most time out in their habitat (perhaps more focused on herps though). In Panama I was nighthiking often, of course an ocelot strolls underneath a balcony full of people drinking while I'm out in the jungle. I was out on that balcony drinking with everyone else alot too but noooo, of course the ocelot wouldn't show up one of those times. 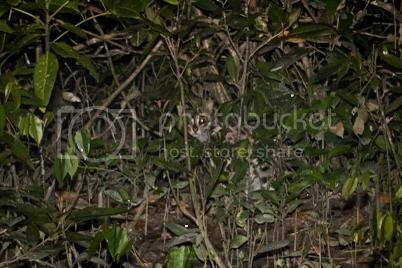 In Malaysia, I'm in the jungle every night and day for 2 months... my friend comes to visit and sees a clouded leopard on his drive in, in his first 20 min in the jungle! I was more happy for him than anything but that doesn't change the fact that I want to see one too! The last year I lived in AZ (2012), there were documented sightings of at least one jaguar and at least one ocelot. A hunter's dogs treed a jaguar in Southern AZ after the hunter thought they were on a lion track. There was also a DOR ocelot found along highway 60, near Globe, in the Northern Sonoran. Last I heard, AZGFD was taking DNA samples to try and determine whether it was wild or an escaped pet. If you look at AZ on Google Earth, you will notice the dark green belt that comes up from Mexico to form the Mogollon rim in East-Central AZ. To the best of my knowledge this is the primary AZ historical range of jaguars, jaguarundis, and ocelots, although you're much more likely to see lions, bobcats, bears, and coatimundi there nowadays. I've seen all of the latter (with some ringtail cats thrown in for good measure ), but the Mexican cats continue to elude me. Mountain Lion - 3 or 4 - one quick glimpse while roadhunting the River Road in west Texas, and 2 or three sightings while driving the entrance road to Calakmul ruins in Campeche, Mexico. Those cats were just calmly walking down the forest road. Actually, we were dissapointed because there are 6 cat species recorded in this patch of forest and we saw one of the only two we had seen before. 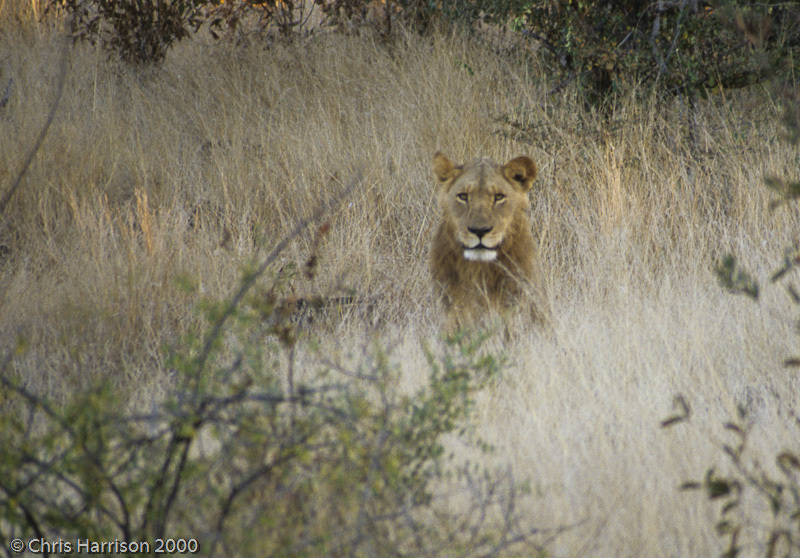 Lion - we got up early in Botswana and went for a drive and found these (there are two here). It was cool because we weren't on a guided safari, just driving ourselves around an empty national park. Interestingly, the best place to see Ocelots in the US is probably Laguna Atascosa NWR in South Texas. However, two ocelots were recently found DOR (and they only think there are 15 there) and so they shut the tour loop of the refuge to vehicular traffic, so your chances of seeing an ocelot there just went from 0.01% to 0.000001%. Watched here hunt for about 20 minutes. The light improved, and she got nearer over time. This series of 4 photos follows in step with that. 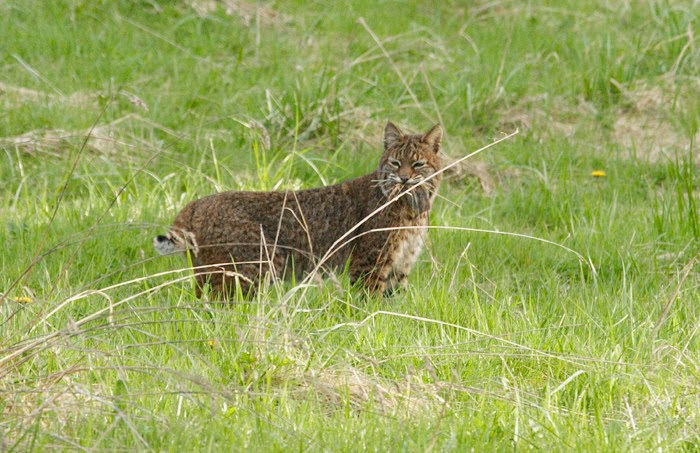 In CA, I see Bobcats from time to time and would label them as uncommon. On the other hand, after more than 30-years of field herping, hiking, and camping, I only encountered Mountain Lions once. That happened last year when road cruising the San Gabriel Mountains. There were two, maybe even three, of them that ran in front of my truck and leaped up a sharp cliff. However, for me, even rarer than mountain lions are California Porcupine and Badger. I have yet to see a porcupine in Cali and the only Badgers I’ve seen were DOR. On a side note, I've been hearing lots of reports of a dark large cat that looks almost like an otter on a nearby refuge. I'm thinking jaguarundi. Are you sure that wasn't an ocelot? Do a search for Cougar hunters treeing Jaguars in Arizona. It has happened a few times over the years, and, of course, with that Ocelot. J-Miz wrote: Are you sure that wasn't an ocelot? I hadn't heard about that ocelot. Thanks for the link. Somewhere out there are photos of a bobcat sitting at the top of a saguaro cactus. A resident of Gold Canyon, AZ watched one of the local lions chase it up there. Can't seem to remember if he was able to get shots of the lion. The shots of that bobcat are pretty funny, though. Picked up a copy for myself while in the Chiricahuas a few years ago. An excellent read, with awesome photos. This has been confirmed, in fact that use be part of the jaguars established range. Unfortunately the jarguar have been eradicated in most of North America. 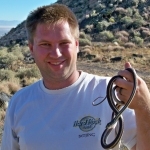 The south western individuals seen are usually migrates from Sonora who made their way up to Arizona and New Mexico. The migration into former range sounds like a success but the plans to build the emigration wall (not sure the status of this) will trap individuals on either side. Thus not enough diversity and numbers to successfully establish a U.S. population. A jaguar chasing a puma around, the difference in morphology is quite clear too. So far I've only seen bobcats in the U.S., but after a long initial dry spell I've now seen them with some frequency and in a variety of locations and settings. I've looked for lynx a number of times but without luck. 1 puma - My wife and I had just a fleeting look as it crossed the park road in front of our vehicle around dusk when we were returning from errands in a nearby town. 1 jaguar - I was cruising the park road one night looking for herps (herping being pretty much my only source of recreation while I was there) and alongside the road ahead of me I saw what I at first thought was a pony; I figured it probably wandered away from a poacher's camp in the forest. But as I pulled up to it I found it was a jaguar, which calmly looked at me from right beside my car through my open car window for a long moment, then just as calmly turned away and disappeared into the forest. 1 margay - My wife and I luckily spotted it where it was spending an afternoon perched relatively low in a tree off a forest path. We've got (slide) pictures of it around here somewhere, but they're nothing special. Tikal is a great place for viewing all kinds of wildlife, by the way, if one finds oneself in the vicinity. The Mayan temple ruins are worth a look, too. 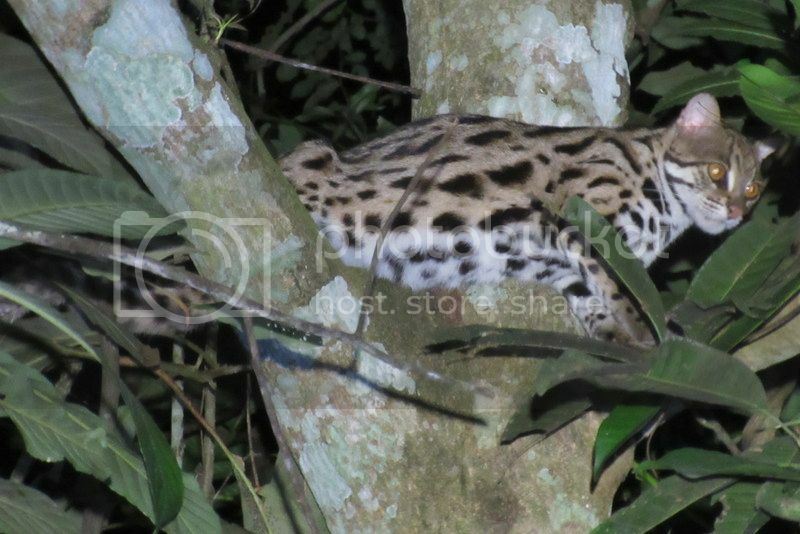 I must say, except for the margay I mentioned above, I've never had a wild cat sighting of any kind that afforded me the opportunity - nor would I likely have the skill to properly take advantage of it - to photograph/film them so beautifully as some folks here have done. Said folks have my envy and gratitude for sharing their shots with us! Thought it looked neat to see a Jag in the more arid environment with those crazy looking chaparral/desert flora. I have a strong interest in jags so I would like too see your photo Gopher. It didn't come up here. Your photo was taken in the US??? That would be the shot of a lifetime! 4 bobcats. First was crossing a logging road at night as my dad and I were driving back from deer hunting. The other three were all crossing the same rural river-canyon highway on the same Kern County, California backpacking trip - the first an adult on my way in, then next two sub-adults just a few minutes apart on my way out - I figured those two were probably siblings that had only recently gone off on their own...does that make sense in mid-April though? 1 cougar. A good friend and I were backpacking in the southern Sierras when we crested a small hill at 11,000+ feet. I was absorbed with watching marmots play when we suddenly saw a large shape fleeing from us about 100 yards away. We only got quick glances of it as it passed between boulders in the boulderfield - maybe 3-4 shots of less than a second each before it disappeared behind a ridge. But no doubt that it was the one and only cougar that either of us had ever seen. 1 jaguarundi. My wife and I were staying in Cockscomb Jaguar Reserve for our honeymoon, but multiple simultaneous tropical depressions had kept us mostly off the trails. After three days of nothing but constant rain, the skies cleared for the first time and we went on a little hike in the morning. My wife had been a bit tired of my flipping earlier in the trip and had made an agreement that I could flip whatever I wanted, but she wouldn't stop and wait for me. Sure enough, on this little jaunt, I was in the process of flipping a log (finding nothing, as always) while she went on ahead, when she suddenly made a quick shout to me. I looked up just in time to see a jaguarundi flee off the trail. She said that when she had come upon it it had been stopped in the middle of the trail with its head down, sniffing at something....quite likely preoccupied enough that I might have gotten a camera shot if I had only been up with her! The second leopard cat was a few days later, also past midnight, while bicycling on the same road in the same area and might well have been the same cat. This time it was on the ground about 30 meters away from me. It stayed long enough that I certainly could have gotten a pic, but I didn't have a camera with me at all because the weather had been horrendously stormy for most of the ride. 1 jungle cat. 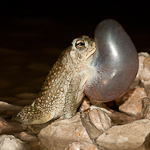 While herping an open area just outside of Udaipur, Rajasthan at the tail end of a minor rainfall, I turned and saw some eyeshine sitting just 20 meters away. I couldn't quite figure out what it was, got my camera out, lost track of it, then found it again just in time to see the beautiful body of a Jungle Cat walking causally away parallel to me. Unfortunately, a bush was perfectly placed between me and where the cat was going, so that I had to keep side-stepping to keep the cat in view, and couldn't manage to keep my headlamp on track and focus the camera and pull the trigger at the right moment to get a shot in the dark. I got to watch it take 5-6 nonchalant strides before the trail it was going down disappeared into brush. 2-3 leopards. Long story that I just told on the main forum, but basically I was stalking eyeshine in the dark which I thought was a small cat, when ma suddenly appeared in a flash and I realized it was a whole family. Only saw the mother leopard's body briefly, but it was from about 10 meters away. Watched her eyeshine appear in various places for close to 20 minutes. Only saw the cubs' eyeshine, never the bodies, and not sure if there was just 1 or 2 of them, because the eyeshine came in different spots but never at the same time. Bobcat: I got to see these cats regularly in SE Arizona but as with most cats they never stuck around long enough for me to get a picture. Lynx: I was going to Thompson MB and stopped at Pisew Falls Provincial Park, we lucked out and heard two lynx screaming at each other. Pisew means lynx in Cree and we though that was kind of a cool coincidence. Even more so when on the way back south an adult lynx was standing in the middle of the road at the same site. Again I missed the shot. Cougar: I used to track cougars regularly on Vancouver Island in BC, this area has tons of cats but the dense salal makes it hard to see them. I'd been close enough where there were prints in mud that had flowing water in it. 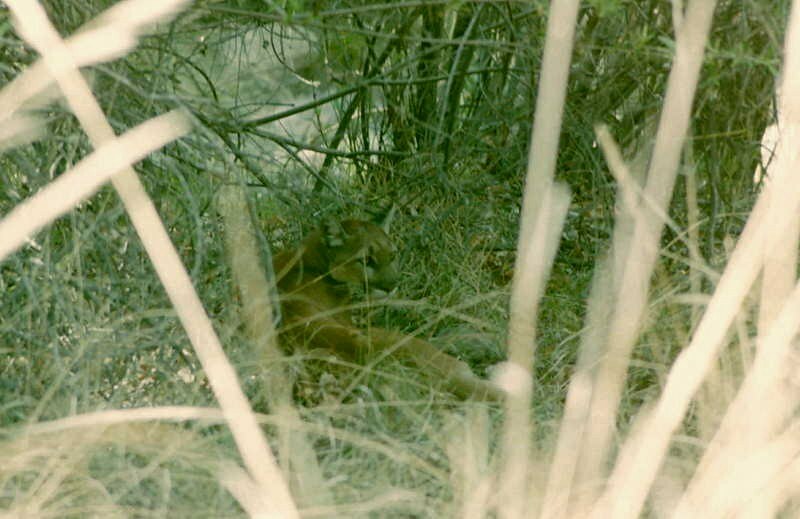 After years of getting skunked in the Pacific Northwest I went down to Arizona every couple weeks there was good sign of cougars including an occasion were one appeared to have been watching me while I caught and measured lizards along a narrow canyon (I went there everyday at the same time). Despite this I never got a good look until one night when we were cruising through an oak woodland and a cougar dashed in front of the car, then three days later some bird watchers told us there was a cougar in the dry creek. A few of us crawled on our bellies for quite a while and got this shot. I've posted it before and it's not a great shot but one of my favorites due to the wait and effort required to get it. Not a great shot? That's a fantastic cougar shot. I've seen a few big cats in Arizona and elsewhere in the United States. Bobcats are common enough in Southeast Arizona and I see a few each year hiking and road cruising. I've seen them in other areas as well. I've seen one Canadian lynx (Lynx canadensis). I watched it walk across a clearing and disappear into some brush in Denali National Park in Alaska 5 or 6 years ago. That was an experience I'll always remember. In Arizona, mountain lions aren't too commonly seen, and I hadn't seen any before this year. I saw my first while cruising a remote mountain road this May. We rounded a bend and saw it slinking across the road. When it noticed the car it got off the road quickly and up over a rock cut. We never got a great view, and briefly considered following it, but considering we were all alone in the middle of the night we thought it might not be the best idea. By far my most heart-stopping big cat encounter happened later this summer (early Augustt), although I was outside the U.S.. I was helping with herp surveys of a ranch above Alamos, Sonora (eventually I'll make a post about what we found down there- it was an incredible area). One night, it was cool and drizzly, and no one else was really in the mood for going out herping. But seeing as I was only there for five nights, and I wanted to make the most of my time, I reluctantly headed out alone (not too smart), with a flashlight, a spare, and a camera to see what I could turn up. 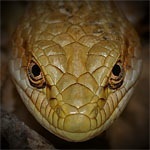 I walked down a dirt track, preoccupied with checking the common anurans that dotted the road. I followed the winding road through dense tropical deciduous forest, looking around my feet with the flashlight. After turning a bend and cresting a hill, I took a look at the road ahead of me, and saw a pair of eyes glowing my flashlight, less than a hundred meters from where I stood. At this point I was about a mile from camp. I slowly approached the eyeshine, at first unsure what I was seeing. The animal looked huge, with a long neck, but I couldn't see more. Eventually as I got closer I could make out the clear outline of a mountain lion in my flashlight beam. Then another pair of eyes emerged from behind the first, and a second adult mountain lion came into view. Needless to say, I was starting to get scared. Barely breathing, I started to retreat back along the road, holding my arms out above my head to make myself look big and speaking in a slow voice: "it's okay, you're alright, nothing to worry about," etc. I heard somewhere you're supposed to do that. Both lions paced back and forth for a few moments, but as I began to get further away they stopped pacing and started coming toward me, one on either side of the road. I started backing up more quickly but they matched my pace. I raised my voice and waved my arms, moving the flashlight back and forth between them as they approached. After the most terrifying ten seconds of my life (I was really sure I was going to be attacked), my noise and movements must've scared them off. Or maybe not, but for some reason they decided to walk together up into the forest on the roadside. They were still coming diagonally toward me, and ended up just uphill from where I was. I could hear some small noises coming from bushes in the area. After frantically scanning the wall vegetation for a long time, I started back, still backing up slowly, and looking all around with my light. After about twenty minutes of this slow retreat, I turned around and hurried back to camp. I didn't breathe easy until I was back in the lighted camp, surrounded by people. 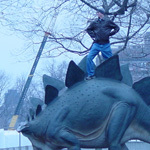 I told some biologists what I'd seen, and they were dubious, so we walked back up to the spot. Although there was no sign that the cats were still around, a set of big cat tracks was visible on each side of the road. Does anyone have any thoughts as to the pair of mountain lions? As I understand it they're normally solitary animals, and was very surprised to see two adults. I don't know much about mammals though, maybe some of you guys have some insight into their behavior. Contrast that "excellent read" with Cloak and Jaguar. The true story about the rogue biologist and the incompetent AZGF/USFWS who killed Macho B. One of the saddest accounts of AZ jaguars that you will read in your lifetime. What is worse is many of the "guilty" are still being paid to work with jags while the low level staffers who were helping with the project were thrown under the bus. Emil McCain and Co. had no business working with that cat, I still get angry when I see one of the last photos of Macho B sitting in a wash wounded, completely dazed, and weak after spending a night trapped in a snare suffering from the effects of a cocktail of drugs that had no business being administered to a 16 year old wild jag.